I had to get a bath. I hate baths. I am a dog. You know me. My name is Sophie. Mom asked me to write tonight since she is still doing stuff for a mort gage. I am not sure what that is but it sounds big to me. Mom and Dad have been talking about it a lot. But I got painted. Please tell me how I am supposed to know that I should not lean on the wall when I go up or down stairs. I am a dog. You could put a WET PAINT sign out and it it was written in paw cuneiform I might get it but I bet not. Mom told me she always to have a moral. 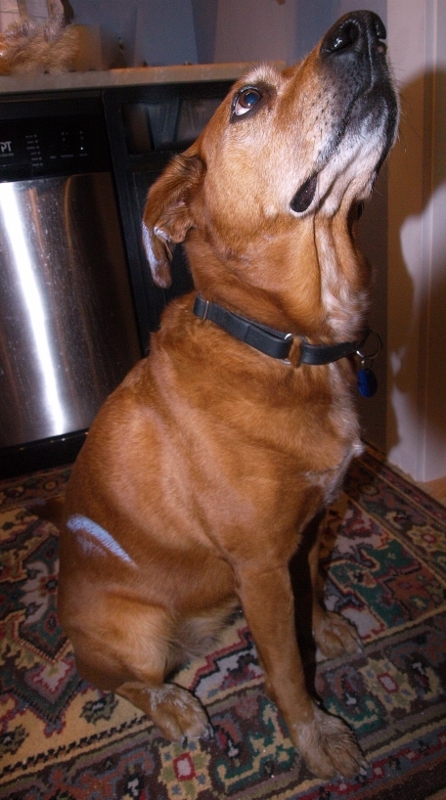 I think the moral of tonight’s blog is dogs cannot read so don’t punish them with a bath if they walk into wet paint. Do you like my blue? Do you have a chicken leg for me? Even good dogs have to have a bath once in awhile, though I am sure you would prefer it to be in the summer !! Just think in a few weeks you will be in upstairs in your own house, all quiet and snug. No more wet paint, noisy men and machines. I like the blue, but not on you !! No chicken legs, but maybe a greenie if you ask nicely !! Hang in there Sophie ! !